Situated just 12 miles southeast of Cleveland and 24 miles north of Akron with convenient easy access to several interstates. Bedford is located less than 30 minutes from "everywhere" - the Cleveland Airport, World Class Health Care, World-renowned Arts and Music, beautiful Lake Erie, Fine Dining, the Cleveland Zoo, Professional Sports, Farmers Markets, Cuyahoga Valley Scenic Railroad, Universities and Colleges, Gateway to the Cuyahoga Valley National Park System, Cleveland Metroparks and many Historic sites. Come visit the many waterfalls throughout Bedford Reservation while bicycling on the many bike paths and enjoy a game of golf. 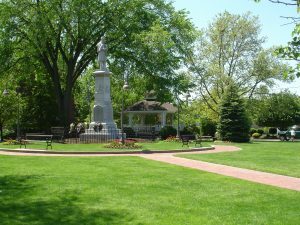 You can experience the beautiful "older" homes in family neighborhoods with trees lining the streets in our own presidential area, a beautiful Town Square where residents gather around the Gazebo starting in the summer with our Parties in the Park and Festivals and ending with the traditional Tree Lighting Ceremony our beautiful square decorated and lit throughout the Christmas season. Stop for a cup of coffee or browse the shops on the main street through our own historic downtown where you can walk and sit in the beautiful City square where you can visit the Veteran's Park and to honor those that served. Welcome to Bedford, hometown America at its best.